We pulled into Shin-Osaka station and alighted at about 7pm, a little while after rush hour. It was still very busy. The furthest east I’d been before this trip was Baghdad. We found ourselves here, the lovely Caminoro hostel in the area of Mikuni. It is run by a couple who have THE CUTEST BABY ON EARTH. They speak excellent English (and Spanish! ), and are marvellously friendly & helpful. We were jet lagged and exhausted so just went straight to bed. 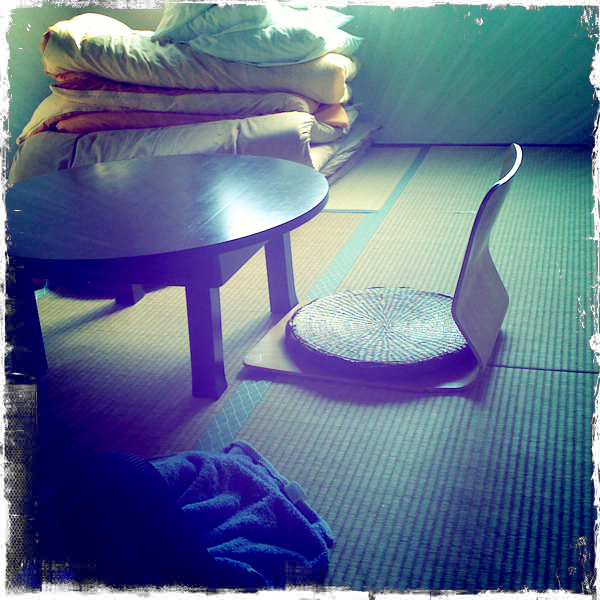 We booked the private Japanese style tatami mat room. Hey – we’re in Japan, why the hell would you not choose all the mega Japanese options? The room was pretty dwtty. It had a little table with two chairs (are they chairs? they don’t have legs), a small dresser and all the bedding in the corner. So we transformed our little room from a living space to a sleeping space and it was lovely. I find sleeping on a futon very comfortable and I had such a wonderful sleep. In the morning we were given a little map of the area and told places we could get breakfast. We ventured out to the covered shopping street that we were staying on. This was properly Osakan and not touristy in any way. Though this was TERRIFYING it was also a pure thrill of feeling being thrown in at the deep end. We found a tiny cafe type place and pointed at some photos of toast and coffee on a menu. Toast in Japan is about an inch thick. Why do they do so many things better than we do? We felt smug with ourselves for having got this far, then freaked out about how we were supposed to pay. TOP TIP: In Japan, the usual thing is to ask for the bill and then go up to a counter near the door to pay after they give you the bill. TOP TIP: DO NOT TIP! Tipping is not a thing in Japan. If you leave a tip the staff are likely to run after you with it shouting ‘you forgot your change!’ The only place you might tip is in a Ryokan. After totally smashing the getting breakfast thing we thought we might take a quick trip into central Osaka to have a quick look before heading to the station to catch the bullet train to Tokyo. We went to the nearest subway station. We spent 15 minutes looking at the tube map which had zero romanji on it, and poking the ticket machine which was also 100% in Japanese. Then we gave up and went back to the hostel to collect our stuff. Me & Luke 1, Japan 1. There was no evidence of the enormous tragedy that was ongoing to the North except that my friend asked us to buy milk and bring it to Tokyo as it was difficult to buy there. 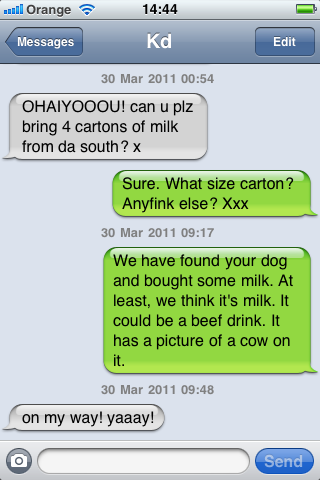 Imagine not being able to buy milk in London. The entire country would collapse without all those cups of tea. (I’ll explain the dog thing in the next blog). The walk back to Shin-Osaka station was much easier in the daylight and we got there in time for the bustling lunchtime trade. We reserved some seats on the 13.40 to Tokyo and embarked on the overwhelming act of choosing which place to have lunch at as there are about 40 different small restaurants in Shin-Osaka station. 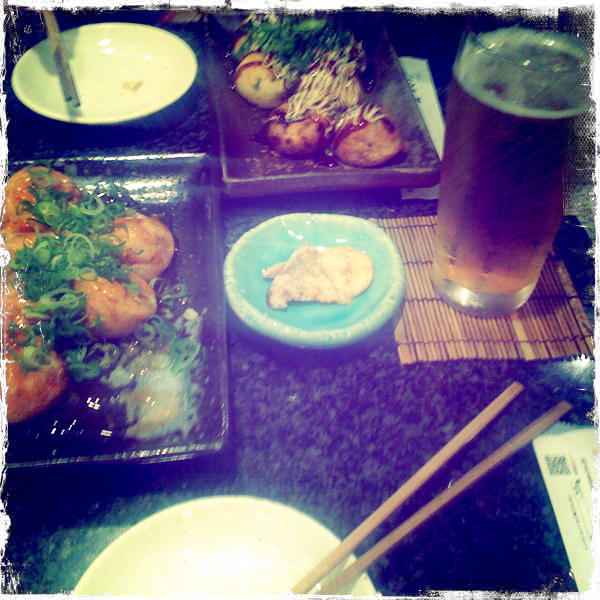 I tweeted asking what we should have and immediately Josie Long & Chris Coltrane shouted the word “TAKOYAKI” at me. 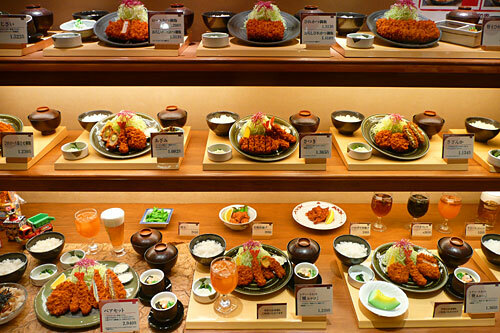 Many, many restaurants in Japan have plastic food models of the dishes they serve displayed outside the restaurant. They are INCREDIBLY realistic. Very helpful if you can’t read a menu, and they let you know what type of cuisine the restaurant deals with. I found us a takoyaki restaurant (in Japan, restaurants tend to specialise in one type of food. eg. ramen shop, sushi place etc). The prices seemed pretty reasonable so I opted for a set meal which included a beer, and Luke pointed at one which didn’t have a picture of a beer on it. It’s possible we ordered too much. I don’t know what a sensible portion is. 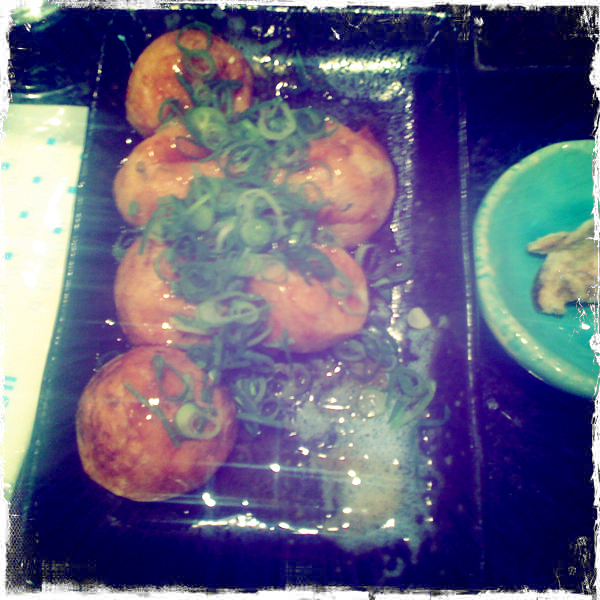 I do know that these delicious octopus dumplings have driven me wild with cravings ever since. Meg Prosser described them as “profiteroles of the sea” and they really are tremendously lovely. I am saving up to buy this from the Japan Centre. If you feel like generously donating to the Nadia Kamil Takoyaki Fund, please feel free. As a reward I will make you takoyaki whilst wearing the colour of your choice. What a deal! The 1st thing they gave us when we sat down in the restaurant were some hot towels. In Japan you will often see this. It’s customary to wash your hands before your meal. Don’t save them at the side til the end like we did. We must’ve looked like right fannies. Fannies with filthy fingers they must’ve thought us. A second successful meal and we left to find our platform to await the shinkansen to Tokyo. *discombobulated twice in one blog? Oh yes, team, get on board.